The PlasCalc Plasma monitoring system measures plasma emission from 200-1100 nm in only 3 milliseconds. The PlasCalc benefits from advanced process control systems and sophisticated algorithms for data acquisition. The recipe Editor tool allows you to easily and rapidly configure, build and save experiment methods. it is easy to build robust recipes for the most difficult plasma processes such as mea- suring film deposition, monitoring plasma etching, examining surface cleaning, analyzing plasma chamber health control and monitoring abnormal pollution or discharge phenomena. PlasCalc comes with an operating software. The Integrated Formula Editor provides easy access to a full range of mathematical and algorithmic functions. An optional Emission Wavelength Library, available for a separate price, provides species identification, while the Wavelength Editor allows you to optimize signal-to-noise. 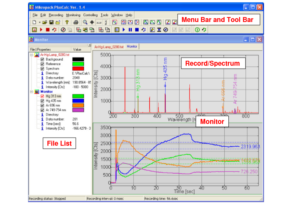 A dual-window interface shows the actual spectrum and all process control information.